What's Next for Indie Artist Exposure? AudioGraphics.com was created on January 15, 1997, making tomorrow our 18th birthday. I set out with the purpose of informing the broadcast radio industry "how" the internet affects its business. The theme centered around there being more than one way to say radio. Archive stories are here. Five years later, RRadioMusic.com appeared as an Audio Graphics' system for radio stations to hear new artists. I could not imagine just how little either group would change with the times. The remaining smaller, independent online radio stations are important for independent artists. Large operators are more interested in time-tested acts and songs, coming from labels they have relationships with. For artists: Fewer outlets means more competition for any station music director's attention. Nothing remains, nor is remotely close to, how songs used to "work their way to the top." From paying bars to play to working social media, an indie artist faces hurdles you could not have imagined a decade ago. In the old world, an act could hope for support from a music label, which would "work" music outlets for exposure time. There was a finite number of those outlets. I don't need to spell out the multiples of music outlets existing today, nor how "labels" have been supplanted by individual artists - tens-of-thousands of them - each trying to get attention. A music director can only answer so many emails containing subject lines of "This song will blow you away!" For the indie artist community, the new CRB rate is terrible. It will mute many outlets, many previously available options where an indie act could hope to reach a few more potential fans. 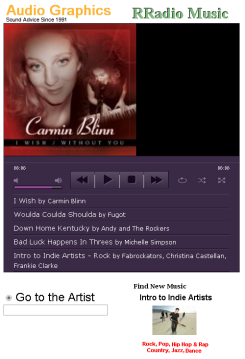 Here is our "Intro to Indie Artists" lineup. What's a "next step?" I'm working on new programming concepts to get around a loss of station exposure. One may fit your needs. In addition to podcast distribution of our "Intro to Indie Artists" series and RRadio Music's offering of songs to stations, I'm working on a platform of music program shorts to be released daily. This is in early stage. I'm deciding between the two page layouts at Audio Graphics or RRadio Music. Record label song distribution of the past is gone. 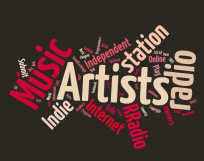 It's mixed today with independent artist song distribution and far more competition. Independent artists must respond by educating themselves on the opportunities a changed world creates. Trying to maintain old world systems of exposure and revenue is wasted energy. Today's artist introduction is to Pop from Christopher Ames. Give "Pictures of Us" a listen. Stations: Add it to your playlist, free.